To assess the utility of swept-source optical coherence tomography (SS-OCT) in visualizing macular hole (MH) closure through gas-filled eyes on postoperative day (POD) 1 using a dual scanning protocol. We examined 30 consecutive patients with full-thickness MH who underwent standard vitrectomy with SF6 (25%) gas tamponade between July 2015 and April 2016. SS-OCT imaging was performed using horizontal raster and 16-line radial scans with manual delicate focusing to evaluate MH closure status. On POD1, optically clear images with visualization of all retinal layers at the fovea were obtained in 80% of eyes, of which 71% achieved complete MH closure. Reasons for unsuccessful imaging included: hyphema (two eyes), dense cataract (two eyes), and gas meniscus interference (two eyes). SS-OCT with dual scanning protocol and manual delicate focusing enabled consistent early visualization of foveal architecture for assessment of MH closure through gas-filled eyes. The recent introduction of swept-source OCT (SS-OCT) has demonstrated potential in overcoming this difficulty. The average wavelength of the light source used in most commercially available SS-OCT machines are centered around 1,050 nm, which is longer than the average wavelength of 840 nm used by most SD-OCT machines. The longer wavelengths used in SS-OCT allow for improved penetration through media opacities and reduce light scattering between phase transitions.2 This property may be especially useful in the setting of imaging gas-filled eyes following macular hole (MH) surgery, where early visualization of hole closure may safely warrant a shorter duration of face-down positioning, thereby reducing the risk of potential complications (such as thrombosis/embolism,3 pressure ulcers,4 and ulnar neuropathies5,6) and make MH surgery possible for certain patients with mental or physical limitations.7 In this study, we assess the use of SS-OCT to visualize early MH closure through gas-filled eyes on postoperative day (POD) 1 using a combined horizontal raster and radial raster imaging protocol. In this observational case series study, we examined 30 consecutive patients with full-thickness MH who underwent standard 25-gauge pars plana vitrectomy with internal limiting membrane (ILM) peeling using triamcinolone acetonide injectable suspension (Triescence; Alcon, Fort Worth, TX) and SF6 (25%) gas tamponade between July 2015 and April 2016. All cases were performed by a single surgeon at the Herzig Eye Institute, Toronto, Canada. On POD1, SS-OCT images, including both horizontal 512 × 512 raster scans (7-mm scan length) and 16-line radial scans (9-mm scan length), were obtained using the DRI OCT Triton (Topcon, Tokyo, Japan) by an experienced ophthalmic photographer with the patient in the upright position. In some cases where image quality was initially poor, the horizontal raster scan was manually shifted to the top or bottom third of the screen or the patient was asked to look slightly up or down, as per optimal scan protocol developed by Ehlers et al.1 for maximizing signal strength on SD-OCT. The same protocol was followed to obtain SS-OCT images at 1 week and 1 month postoperatively to further evaluate MH closure. Additional clinical data collected included demographic information, visual acuities, corneal/anterior chamber opacities, lens status, axial length, preoperative minimum MH diameter, and postoperative percentage gas fill. Face-down positioning was maintained 8 hours per day for 7 days postoperatively in all patients regardless of MH closure status, as per routine protocol. This study was performed in accordance with the ethical standards outlined in the Declaration of Helsinki, and study approval was obtained from Chesapeake IRB Services. The SS-OCT images were read by two independent expert OCT readers (NC, DL). A successful scan was defined as an optically clear image with complete visualization of all retinal layers at the fovea. Complete MH closure was defined by the tissue apposition and adherence of all retinal layers at the central hyper-reflective line (Figure 1A), whereas partial MH closure was defined as physical approximation of some of the retinal layers (Figure 1B). An open MH was defined as none of the layers of the retina adjoining one another (Figure 3B). Unpaired student's t-test was used to compare the mean minimum MH diameter between eyes that achieved complete closure by POD1 and eyes that did not. A P value of less than .05 was considered statistically significant. Representative swept-source optical coherence tomography image of macular hole (MH) closure statuses on postoperative day 1. (A) Complete MH closure marked by apposition of all retinal layers at the central vertical hyperreflective line, presumably the site of tissue regeneration. (B) Partial MH closure showing physical approximation of the retinal layers without complete apposition of the tissue. 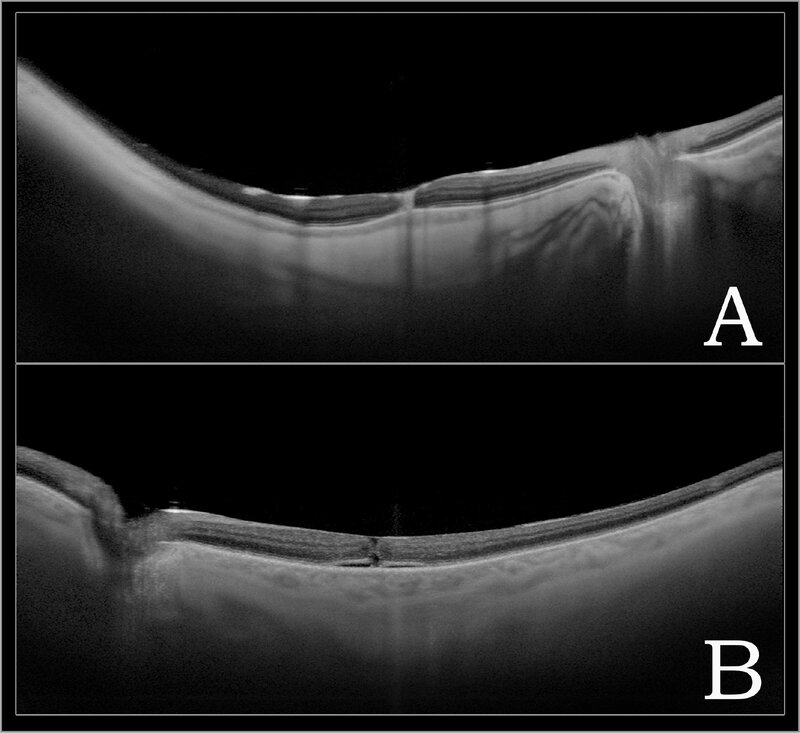 Swept-source optical coherence tomography images of the same eye imaged with two modes on postoperative day 1. (A) Horizontal raster scan showing apparent macular hole (MH) closure with complete approximation of the retinal layers. Note the clear detail of the retina, sclera, and orbital bone in this myopic eye. (B) A 16-line radial scan reveals incomplete MH closure with a radial line scan. 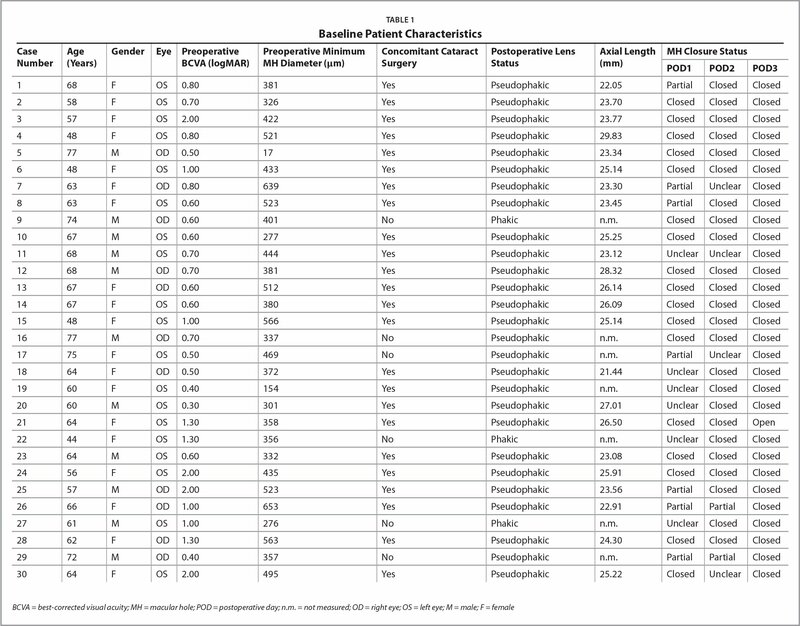 Baseline characteristics of patients are shown in Table 1. We identified 30 eyes with a mean baseline best-corrected visual acuity of 0.91 logMAR. Patients ranged from 44 to 77 years of age (mean 62.9 years ± standard deviation [SD] 8.3 years), consisting of 19 women and 11 men corresponding to 11 right eyes and 19 left eyes. The mean preoperative MH diameter was 408.8 μm ± SD 133.8 μm (≤ 200 μm in two eyes, between 200 μm and 400 μm in 13 eyes, and 400 μm or greater in 15 eyes). Twenty-seven eyes were initially phakic, of which 26 had pre-existing cataract development. After explaining the risks and benefits of cataract surgery to the patients, 24 underwent concomitant phacoemulsification cataract extraction and intraocular lens implantation, resulting in a total of 27 pseudophakic eyes postoperatively. 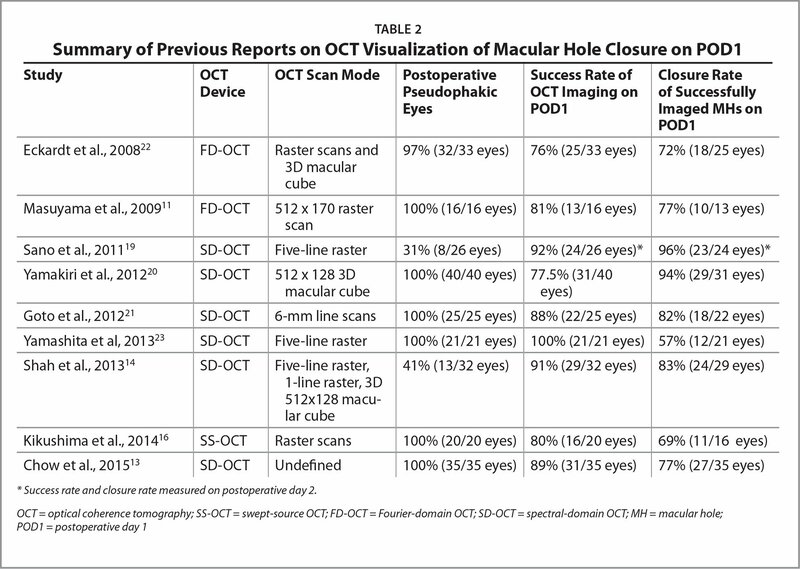 On POD1, the postoperative status of the macular hole could be successfully determined in 24 of the 30 eyes (80%) by SS-OCT. Of the successfully imaged eyes, 17 eyes (71%) achieved full MH closure, and seven eyes (29%) achieved partial closure (Figure 1). 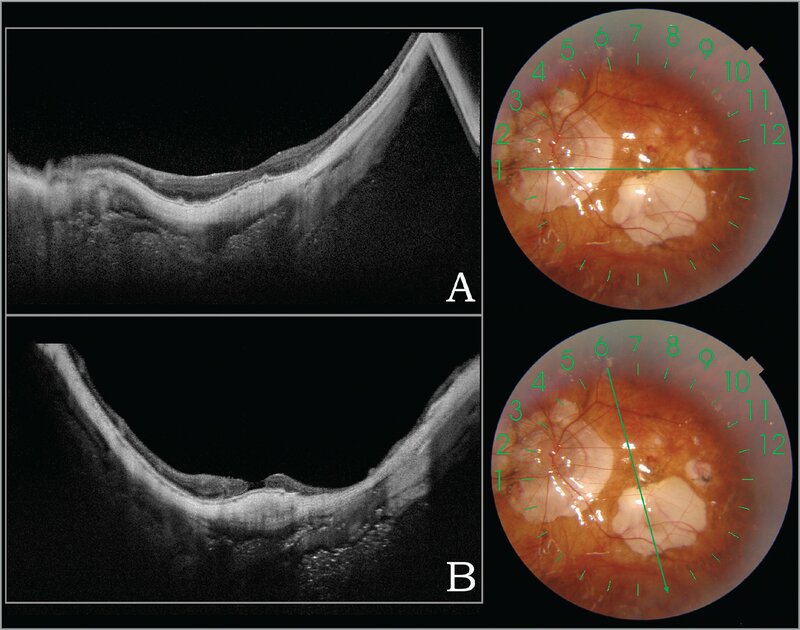 Of the six eyes (20%) that failed to be clearly imaged, two had hyphema (Figure 2A), two had dense cataract (Figure 2B), and two had interference and backscattering of the OCT signal from the gas bubble meniscus due to a low gas fill of below 80% (Figure 2C). MHs that achieved full closure by POD1 (387 μm ± 127 μm) had a significantly smaller preoperative minimum diameter than MHs that did not (514 μm ± 108 μm; P = .02). In the seven eyes with high axial length (> 25.5 mm), six achieved full MH closure on POD1, and one could not be clearly imaged (Table 1). Anterior color photography of eyes with unsuccessful swept-source optical coherence tomography scans. (A) Low vitreous gas fill. (B) Dense cataract. (C) Hyphema. One week postoperatively, clear visualization was achieved in 26 of the 30 eyes (86.7%), of which 24 eyes (92%) achieved complete MH closure and two eyes achieved partial closure (8%). The main reason for unsuccessful imaging at the time was attributed to the backscattering of the OCT signal from the meniscus of the gas bubble. At 1 month, postoperatively, successful SS-OCT images were obtained in all eyes: 29 with complete MH closure and one with re-opened MH. Standard MH repair with pars plana vitrectomy, ILM peeling, and gas tamponade is a safe and effective procedure with a success rate of more than 90%.8 However, the most burdensome aspect of the procedure for the patients is the postoperative face-down positioning, which is typically compulsive and maintained for a week or longer. This is not only inconvenient and uncomfortable for the patients, but may cause or exacerbate other complications, especially given the older age range for MH patients.4,9–12 In recent years, there has been a significant shift toward an OCT-based positioning regimen following MH surgery. Indeed, several studies have demonstrated that patients may safely discontinue face-down positioning once anatomic closure is demonstrated on OCT imaging.13–15 Previous OCT imaging studies have been able to identify MH closure in gas-filled eyes within 24 hours of the surgery with variable successes (Table 2). However, there has not been a consistent definition of a successful scan or complete MH closure. In the present study, we evaluated the feasibility of using SS-OCT in gas-filled eyes on POD1 and were able to reliably visualize the status of MH closure in virtually all eyes that did not have significant anterior chamber pathology (dense cataract/hyphema). We also confirmed that by POD1, the majority of MHs (71%) had already achieved complete closure using a dual OCT imaging protocol (horizontal and radial raster). Together, these results highlight the feasibility of evaluating early MH closure using SS-OCT.
Kikushima et al. were the first to report successful SS-OCT imaging of MH closure within 24 hours of surgery.16 In their study, 16 of the 20 gas-filled eyes were successfully imaged by POD1, of which 11 (69%) had confirmed MH closure and were permitted to discontinue face-down positioning. Building on their study, we conducted the present study with a larger number of patients and three modifications to the SS-OCT imaging protocol. First, rather than defining a successful image as a score of 60 or more on the automatically generated Topcon image quality factor (QF), we defined successful image as clear visualization of all retinal layers at the fovea. This subjective criterion may have resulted in a more accurate and clinically relevant assessment of image quality. Second, in addition to the traditional horizontal raster scans (512 × 512, 7-mm scan length), we added 16-line (9-mm scan length) radial scans to the imaging protocol for all patients with MH. Schneider et al. has demonstrated that high-density radial scanning is substantially more accurate in detecting small full-thickness macular defects than raster volume scans.17 Indeed, by incorporating radial scans into our imaging protocol, we detected incomplete closure in MHs that appeared to be completely closed on horizontal raster scans (Figure 3A). Third, as described, we employed techniques from the optical scan protocol developed for SD-OCT by Ehlers et al. to isolate pathology and maximize signal strength. This resulted in improved scanning quality, especially in patients with vitreous gas fill of less than 80% (Figure 4). (A) Anterior color photography of an eye on postoperative day 1 with approximately 75% vitreous gas fill. (B) Horizontal raster scan taken with automatic localization showing poor visualization of the retina. (C) Manual delicate focusing on the same eye resulted in improved image quality and better visualization of all retinal layers. The choroidal detail is also well visualized. Limitations of this study include the fact that 27 of 30 eyes (90%) were pseudophakic postoperatively, and pseudophakia has been associated with improved OCT visualization of macular holes on POD1.1 Questions have also been raised as to whether simultaneous phacoemulsification cataract extraction might facilitate results of MH surgery, but this specific factor has not been examined in a controlled fashion.18 This study also only examined a single SS-OCT device, when other devices may have different results. In summary, SS-OCT enabled consistent, early visualization of MH closure through gas-filled eyes on POD1. The dual scanning protocol provided superior visualization of foveal architecture compared to line scans alone, whereas manual delicate focusing improved image quality by maximizing signal strength. Combined with these techniques, SS-OCT may provide sufficiently high-quality tomographic images to assess early MH closure in gas-filled eyes and help guide postoperative face-down positioning. From the Faculty of Medicine, University of Toronto, Toronto (DQL); Vitreous Retina Macula Specialists of Toronto, Toronto (NC); and the Department of Ophthalmology & Vision Sciences, University of Toronto, Toronto (NC). Dr. Choudhry has received equipment and speaker honoraria from and is a consultant for Topcon Medical Systems. Dr. Li reports no relevant financial disclosures. Address correspondence to Netan Choudhry, MD, FRCS(C), Vitreous Retina Macula Specialists of Toronto, 3280 Bloor St. West, Suite 310, Etobicoke, ON M8X 2X3 Canada; email: netan.choudhry@vrmto.com.